Guess what the sisters are up to. Peanuts plays with her favorite shoe, donated by the "Mom's Junk" Foundation. She sees a camera flash and decides to brand it evil and unworthy of her attention. 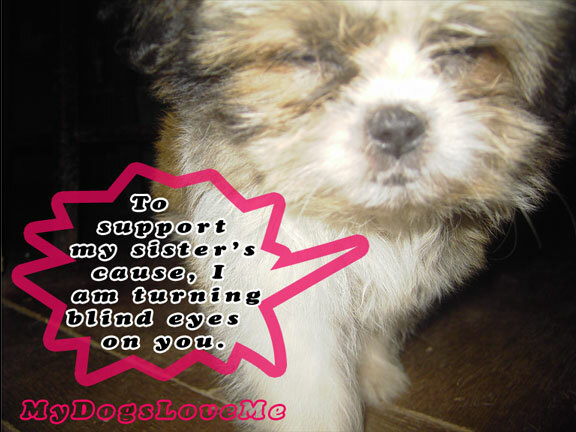 Chooey follows her role model and supports the cause. Peanuts makes a Press Release. I wonder what they'll be up to next. Happy Monday, everyone! Hmm... how do you feel about cam flashes?? Will you support Peanut? If you're ok, perhaps you can be the big bro and educate them on how they will have more "15 minutes of fame" with a cam then without the cam!!! Then they can make diva demands like updated cam technology! Those silly flashes will get you every time! 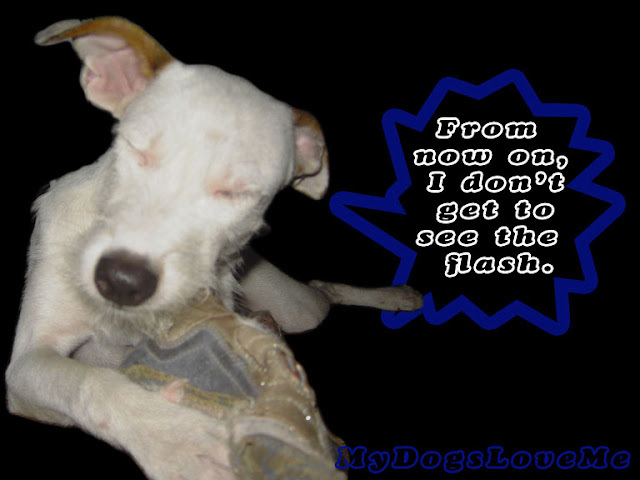 Yes, sometimes those flashes can be annoying! They must be forming a club!! Haha, the evilness of the camera flash! Quite right! 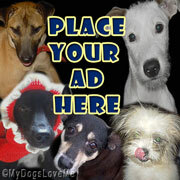 We think we should all go on strike until they get rid of the flashes - not hunger strike though, BOL! I agree with the camera flashes and when they dog catch your eyes they make doggy eyes evil looking! Those flowers are called "million bells" or calibrachoa. They sort of look like mini-petunias. I have just started shutting my eyes when ever she comes near me with the black flashy box. Hi! Thank you so much for coming to my party and helping to make it a success! I was really happy to met some nice dogs, as I don't know many of them. Its a pleasure to met you and thanks again! 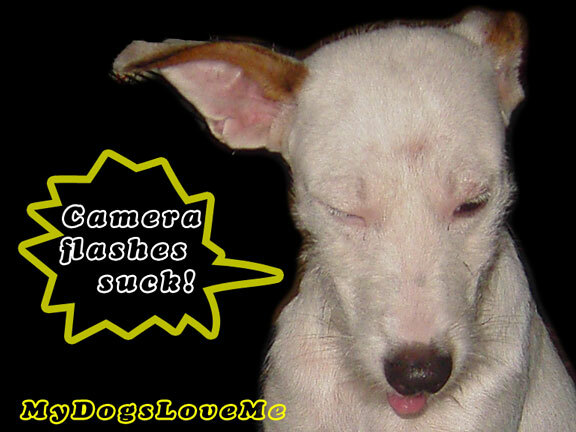 We so agree about those annoying camera flashes! Oh the evil flash...somedays it seems to follow me EVERYWHERE! Oh yeah, we hate that flashy box here, too! Sammy even heads under the bed when he sees it pointed at him. Thanks for stopping by to see how we were, Mum was lacking on her blog duties, something about real life, blah blah blah. 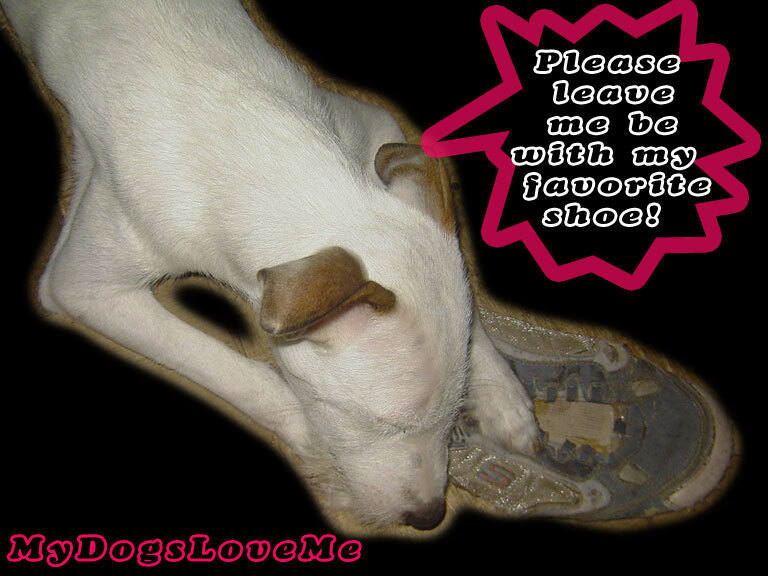 Peanuts, we do hope that is an old sneaker! Oh dear, not the flash monster!! You need to form an anti camera flash club! Bol. We don't like camera flashes either! They are evil! Very nice post. I simply stumbled upon your weblog and wished to say that I've really enjoyed surfing around your weblog posts.